That all happened during the Acts of Vengeance story, which was a great time for Spidey to have some extra power at his disposal. The Uni-Power makes its wielder adopt a standard look, and that's what this figure gives us. The bottom of the uniform is white (or at least pale gray), while the upper portion is metallic blue with heavy black shadows and an intricate starfield. The only thing that reveals this as Spider-Man is the bit of red webbing on the mouth - usually the Captain Universe costume leaves that exposed, but since Spidey was wearing his mask when he powered up, that's what we see. The mask is removable, in theory. The way the figure is designed, his mask is a full-head covering that can be slipped off to reveal the determined Peter Parker face beneath - there's even an extra hair piece to cap him off. Unfortunately, the mask is ridiculously tight on the head. Even tighter than Starbuck or the original Iron Man. I couldn't even get it all the way onto the head to begin with, so forget trying to get it off again. It went onto a spare head, and it'll probably stay there. After bonding with an alien symbiote, Eddie Brock became the creature known as Venom! With the symbiote fueling his anger toward Spider-Man, Eddie Brock was almost consumed by his hatred before finally breaking free. Remember back when Target was supposed to get an exclusive series of Minimates? This is the mystery Venom that nobody could puzzle out. What sets Transformation Venom apart from Powerhouse Venom? At first glance, nothing but paint. This is clearly Todd McFarlane's Venom, with fairly smooth eyes, lots of aligned teeth, and only minimal anatomical detailing. He's even got new hands, with long, pointed fingers. But this wouldn't be Transformation Venom without a transformation, right? If you remove the mask and the powerhouse chest cap, you get a version of Eddie Brock with the symbiote retracted down far enough to reveal his chest and shoulder blades. He gets clawed hands (the usual ones, shorter than the ones mentioned above) with the white patch on the back - unfortunately, one was missing from this set when I opened it, and it's not like I can expect DST's customer service to have pieces available three years after the fact. On the plus side, any plain black hand will look okay in its place. Eddie gets an orange version of Tony Stark's hair, and has a screamingly wild expression on his face. This guy is a total loon! And hey, we're not done yet! 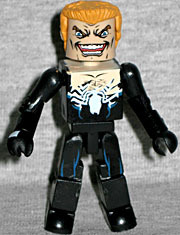 The set also includes two "human" hands and a black jacket with the white Venom spider on the chest. What's that about? It simulates the way the symbiote could mimic street clothes, to help the wearer go incognito. Clever! The coat itself comes from the never-produced Ghost Rider movie Minimates, where it would have been Johnny Blaze's stunt jacket. Way to finally get some use out of that investment, guys! Sorry if that sounded sarcastic - it was sincere. Eddie also has a second face painted on the back of his head, one with a calmer and yet still sinister expression. 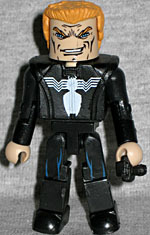 He's also got a camera, which originally came with the Series 17 movie-based Eddie Brock. It made sense there, since he was a photographer - in the comics, Eddie was a reporter. 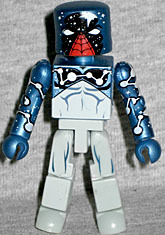 Cosmic Spider-Man is a figure with a very nice look, one that's rarely been done in toy form, and his only real flaw is that the mask doesn't fit as easily as all the rest in this series. 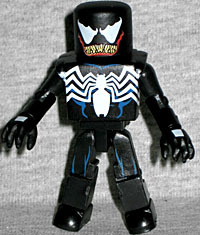 Transformation Venom, meanwhile, is not only the best Venom Minimate you can buy, it's one of the best Venom toys ever released, period. Art Asylum absolutely knocked it out of the park with this one.